I was at the library today searching for copies of Seeds of Destruction, and Seeds of Deception, both on Genetically Modified seeds (which my librarian is working on getting for me) when I came across a rather thick volume of short stories by Ray Bradbury. Because, of course, I couldn’t leave the library empty-handed. Anyway, I realized as I perused the fiction section “B” shelf (and that was as far as I got) that it was Bradbury who had written Farenheit 451, which I read some time ago. It was thought provoking and a bit scary I’d have to say. Set in a future where books were banned, burned if found, and the owners murdered. I had enjoyed it so I decided it was to time to investigate some of his other writings. 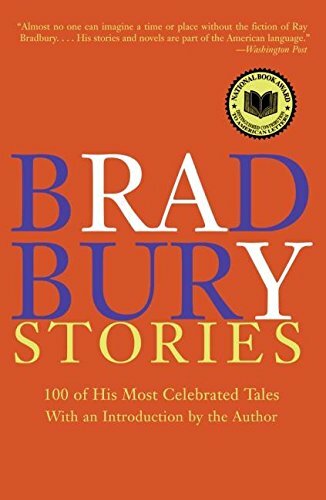 I opened this book, simply titled Ray Bradbury Stories, touted as 100 of Bradbury’s Most Celebrated Tales at the bottom of the front cover. It was published, to my surprise, in 2003, by HarperCollins. Imagine 100 stories, I never even knew existed by an author I already knew I liked. But, even more surprising when I opened the front cover was a list of thirty-six books he had written as well. Who knew? Well, lots of people probably, but not me. So I have begun to dig in. Read the first story, and as short as it was, roughly 5000-6000 words, I couldn’t stop reading till I’d finished it. “The Whole Town is Sleeping,” might keep me awake tonight listening for sounds that go bump. Looking forward to reading more. I plan to do an overall book review when I finish it. If you’re reading this, check it out for yourself. It has elements of Edgar Allen Poe stuff, but the writing is more modern; an easy, enjoyable read. So, I read a few more stories in the book, and each one is unique. Some mysteries, some funny, but I’ll be honest I’m not one to read a large volume of short stories straight through. I pick and choose and enjoy the process. I guess as an author, Bradbury felt it important to get his stories all down in one volume. And often publishers and editors do that with well-known writer’s works. It’s just too much for me at one time. I would suggest purchasing the book to hold onto. And on the nights you head to bed and can’t sleep right away, pick it up and read a couple stories. That’s what I plan to do.